Geraldine Wharry in her group mentor session with her talented (you might be wearing their designs in the future) young designer mentees. This month I sat in one of the group mentor sessions organised by Startup Direct. It was run by Geraldine Wharry, the group mentor, a fashion forecaster and designer in her own right. She has a huge breadth of knowledge in the fashion industry having worked with “WGSN” (senior designer and trend forecaster), with “7 For All Mankind” (senior designer), with “Rip Curl” (design director), “The British Library”, “Samsung” and the”Shanghai design centre” to name but a few. She started “Trend Atelier“, a London-based inspiration studio specialised in future trends research and analysis, as creative director in 2011. She has worked all over the world and therefore has a huge amount of expertise to share with her Startup Direct loan mentees. She also has many contacts in the fashion industry whom she gets to come along to the occasional group mentor session to act as guest speakers. I had the good fortune of sitting in one of these sessions. 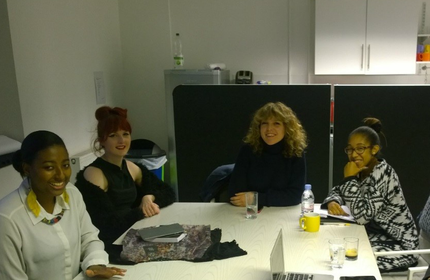 The mentees, Eleanor Bret-Day, Roxanne Wright and Danielle Ailah were incredibly interesting young fashion designers who had all started their own fashion labels, in part due to a loan from Startup Direct. The session I attended was on the importance of branding in the fashion industry. The mentors educated the mentees on the importance of a branding in the fashion and retail world referring to a brand as “the bridge between a product and a consumer”. The session was a whirlwind of shared knowledge with discussions on the power and sustainability of a coherent brand, the problems of over advertising, the importance of a good mood board and the huge business potential of some of the mentees products. It provided the mentees with business advice, confidence in their products and reiterated the power of PR in the fashion world. A good product is the car in a business machine that will only drive with the wheels of good marketing and branding. The session was interesting, informative and of huge business advantage to the mentees, reaffirming the power of mentoring on a successful business. Want to become a mentor?